E-Z Scan AB5500+ Combination A-Scan / B-Scan - Gold Coast Ophthalmic Instruments, Inc. 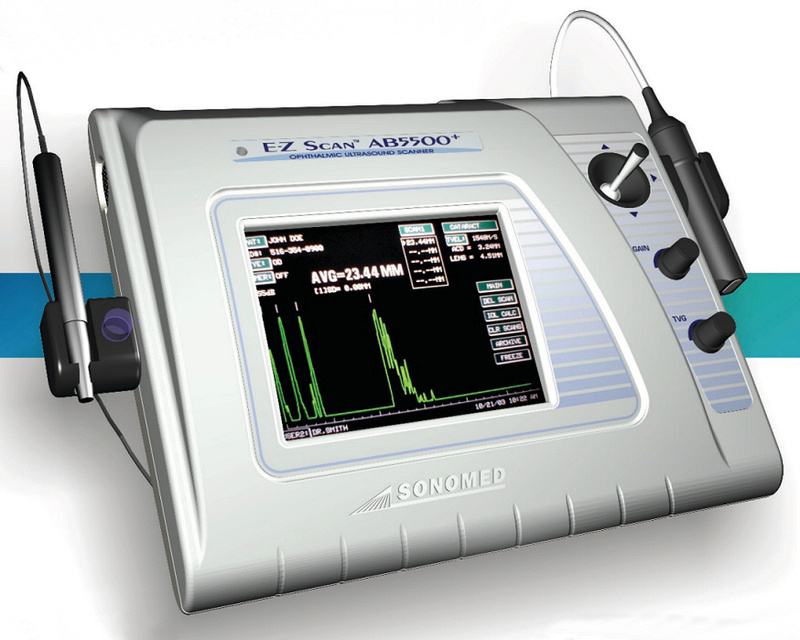 The E-Z Scan B-Scan provides excellent resolution with a full set of features including display of A-scan trace across a selectable vector, zoom and pan capabilities, multiple color and grayscale display modes, measurement functions, annotation, and more. The real-time B-scan display, adjustable gain and TVG controls, and enhanced “high-resolution” mode which produces a scan with 256 line vectors facilitate optimal diagnostic viewing. Two A-Scan probe styles are available – standard or soft-touch – depending upon user preference and scanning application. Built-in immersion scanning capabilities is provided with optional Prager shell for ease of use and the highest assurance of accuracy and repeatability. The E-Z Scan is available in two configurations: as a combination A-scan / B-Scan (E-Z Scan A/B) and as a stand alone B-Scan (B5500+).